I ordered the wrong size replacement foam as I did not really know what to measure. Upon arrival I called Simply Speakers and they knew exactly what I needed. I had the correct part in a few days with no extra charges and no hassle. The install went perfectly, the instructions are great and the speaker works like new. Worked perfectly! I repaired the sub-woofer on my 2001 BMW Z-3 Roadster and it sounds better now than before... 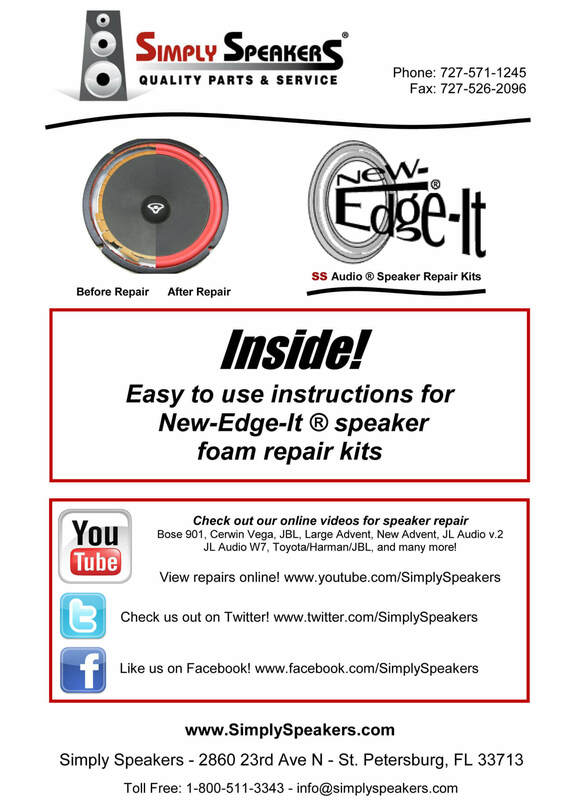 I highly recommend the use of Simply Speakers foam speaker repair kit. Easy to use and outstanding results. Saved about $600! 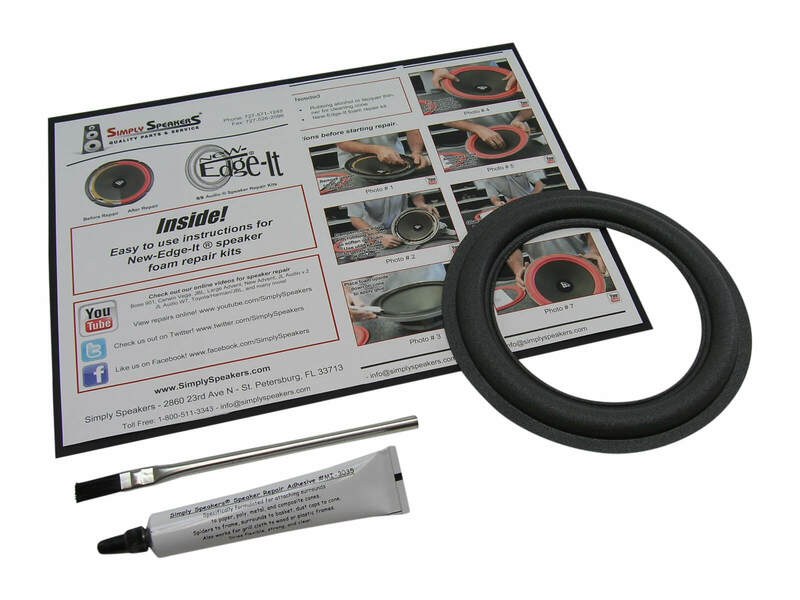 This repair kit is perfect. 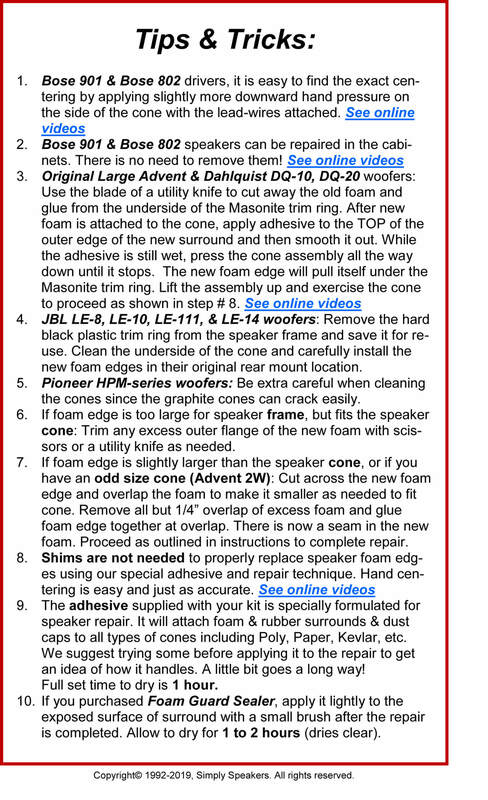 Great instructions, easy to follow and the results are "good as new". Very happy. 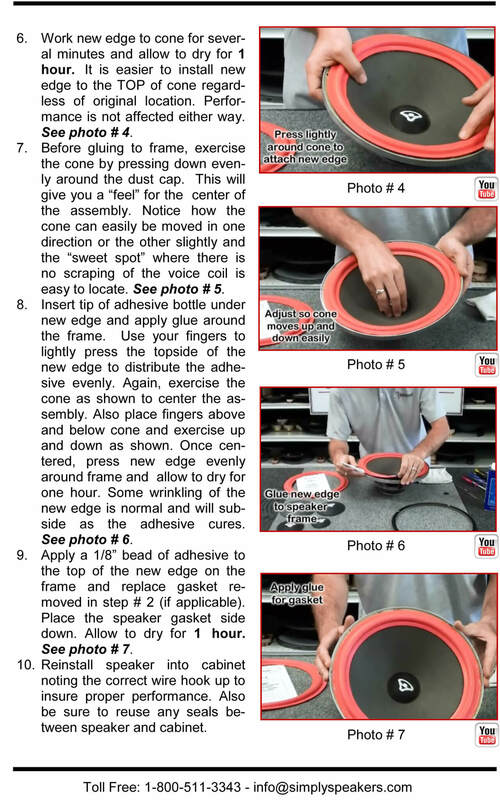 Good product -- the instructions and videos were very thorough. Be sure to take your time and do it properly -- no short cuts. End result was perfect. Excellent product. 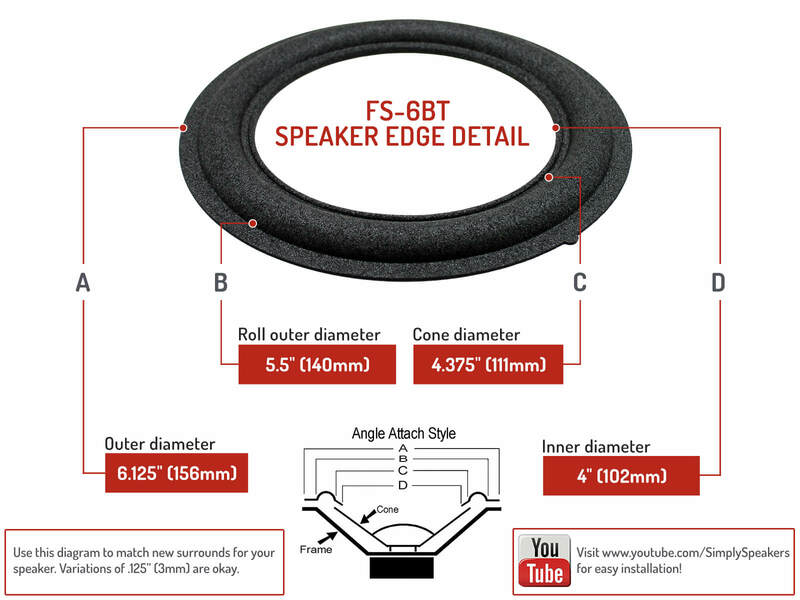 Hard to find a 6" subwoofer speaker. Didn't want to take a 6.5" and mod it. 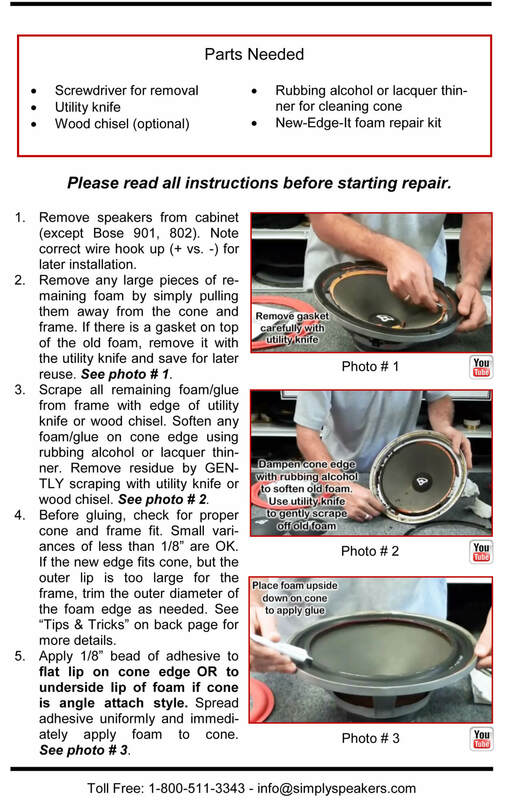 So, repairing the old speaker was probably the best solution--cheaper and easier than the other options. But, I do think $20 for a single foam surround is a bit much. Bought this to fix the subwoofer in my BMW M roadster as the foam had rotted out. Thought I had to replace the speaker and looked everywhere couldn't find one that was priced reasonably and thought I was hosed. Finally came across this option in my searches online. Process was very well explained in the directions, it was easy, and now my speaker sounds like new!! (is 14 yrs old). Great option for the BMW early Z3's that the Harmon- Kardon speaker system with the hard to replace 6 inch sub. I would use this kit again if needed on any of my speakers. Thanks a lot! I am absolutely delighted. I spent most of my time getting the speaker out of the car -- always a little tricky. After that it was smooth sailing. Take a little time with the cleaning of the old material, glue, etc. and the rebuild will then go quite easily from there. The speaker now sounds as good as new. The online video (for Bose 901s, but the principle is the same) was helpful, as well. Kit was very simple to install. My 9 yr old grandson and I did it in approximately 1 hour. Then let it set overnight. Works great. Definitely a better value than the $800 wanted from the local BMW dealer. The repair kit was exceptional. Everything you needed was included and the instructions and product were absolutely first rate. This kit allowed me to repair a speaker size that is very, very difficult to source new. I would definitely order from Simply Speakers again. 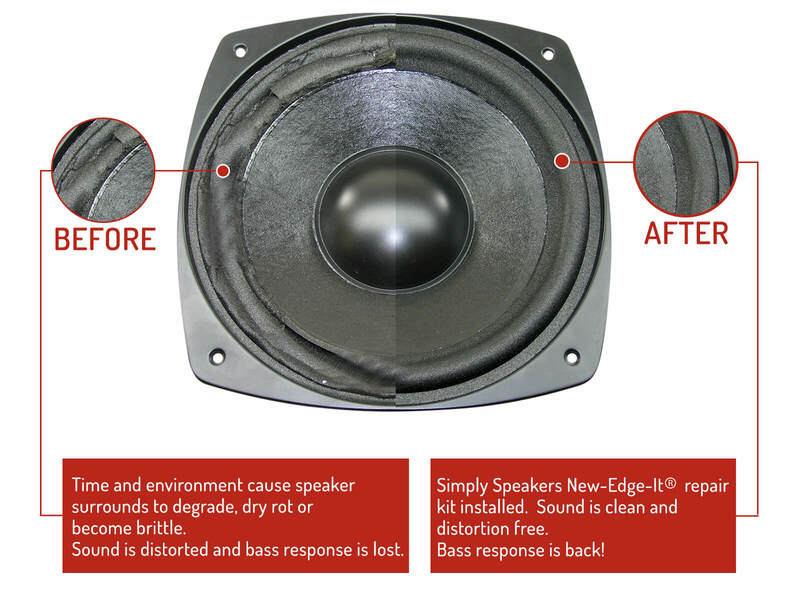 Great product, made the speaker like new again. Sure beats going for an aftermarket woofer, or buying an OEM replacement for $600.00. Q: What is the foam guard for? Will it enhance durablilty or degrade the sound? 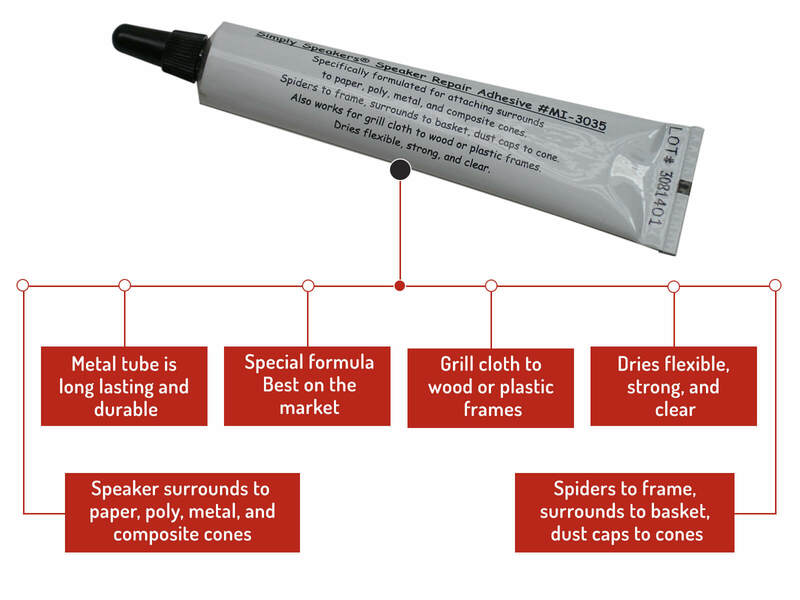 A: The sealer enhances durability and does not degrade the sound. Thanks! Q: Is this kit for the single rear sub-woofer of the harmon-kardon sound system? A: Yes! This is the correct kit for MOST Z3 models. Be sure to check yours before ordering to determine the size. We also sell the dual 5.25" woofer version if needed. BMW: Z3, M Roadster, Harman Kardon Subwoofer, 65.13 - 6 902 837, 280 00 062, and many more!